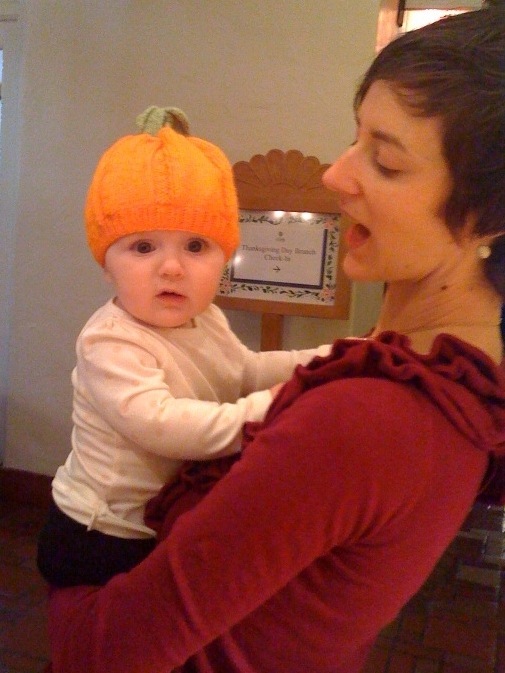 Hungry for 1st La Fonda Thanksgiving! La Fonda also took care of its own by sticking to its long held tradition of giving a turkey to each employee, to make sure all had a bountiful meal. 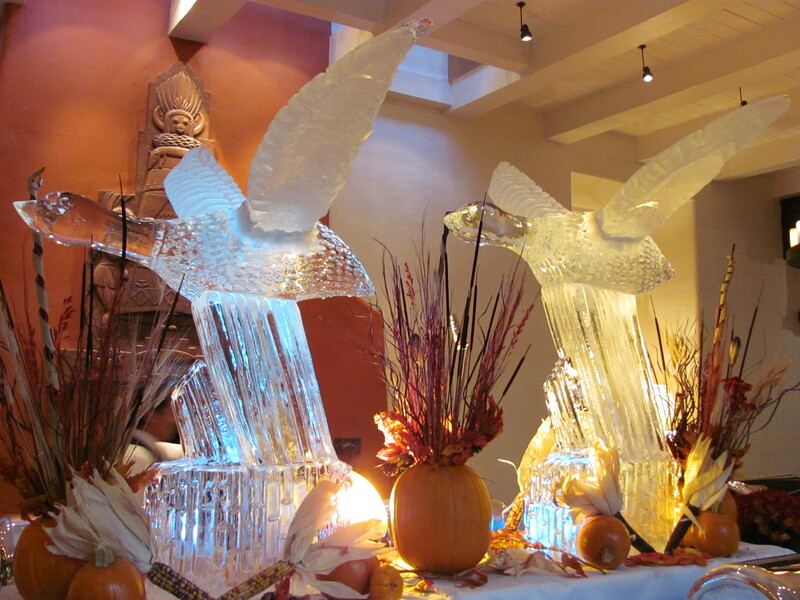 We at La Fonda have much to be thankful for, and I hope each of you had a wonderful Thanksgiving! 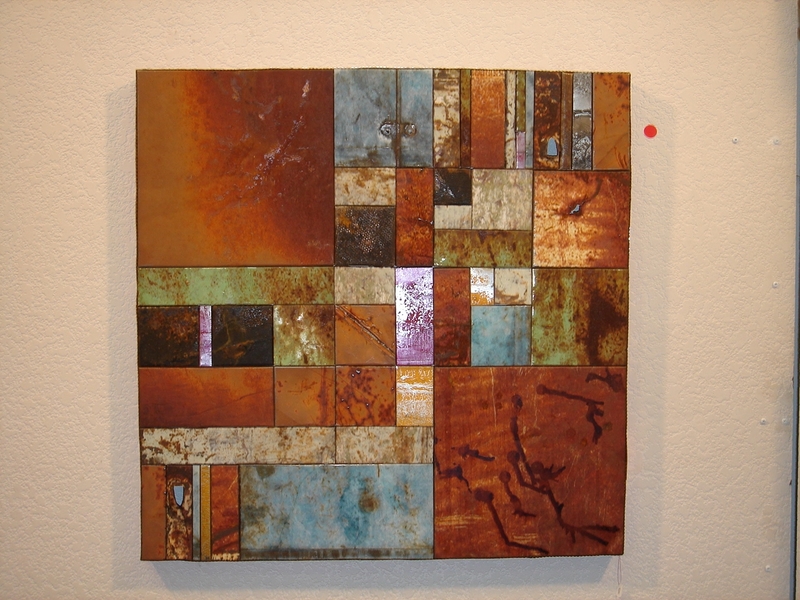 Recycle Santa Fe’s Art Festival occurred this past weekend at El Museo Cultural de Santa Fe, located in the Railyard. Attached are a few pics showing some of the goodies from the show. From evening gowns to placemats, there was something there for everyone. Each product must contain at least 75% rescued/reused materials and the creativity and artistry were amazing. I came home with a fabulous piece of art. This is the 12th year of the festival and it shows how many Santa Feans care about recycling and helping our planet survive. 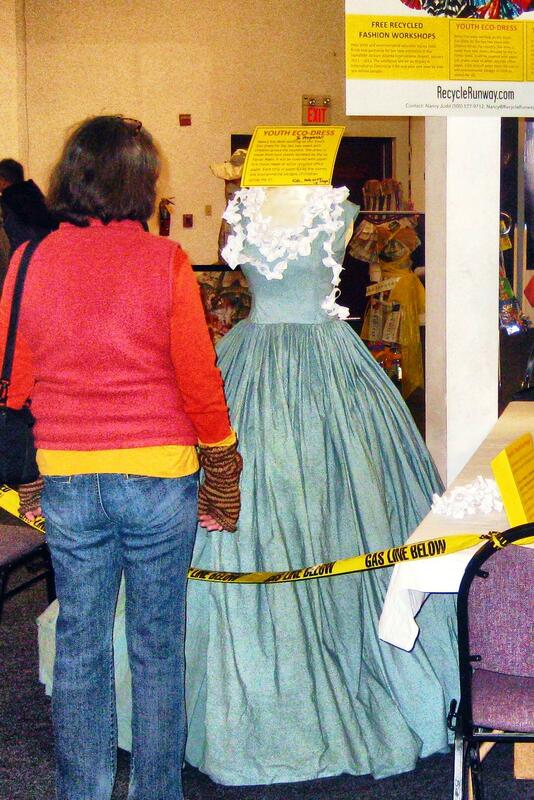 This lovely gown used to dress a bed. 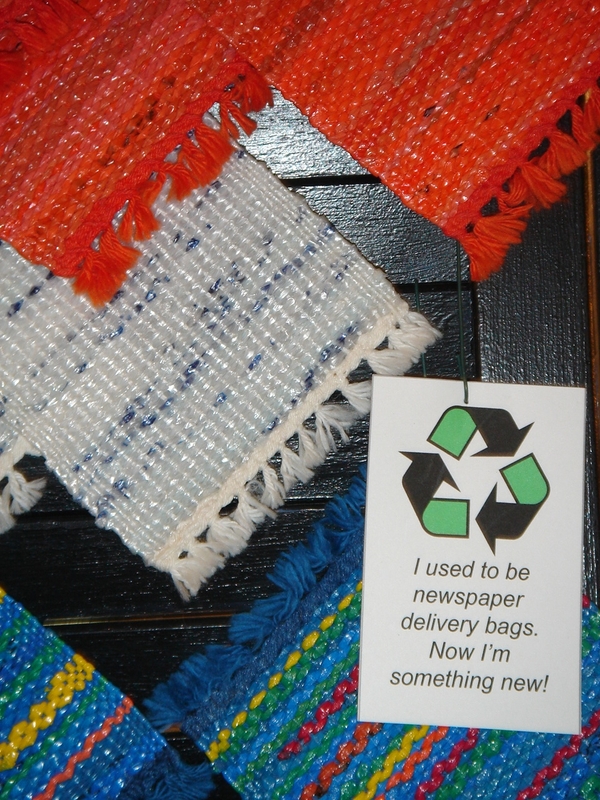 It is made from recycled sheets donated by La Fonda’s Housekeeping Department. 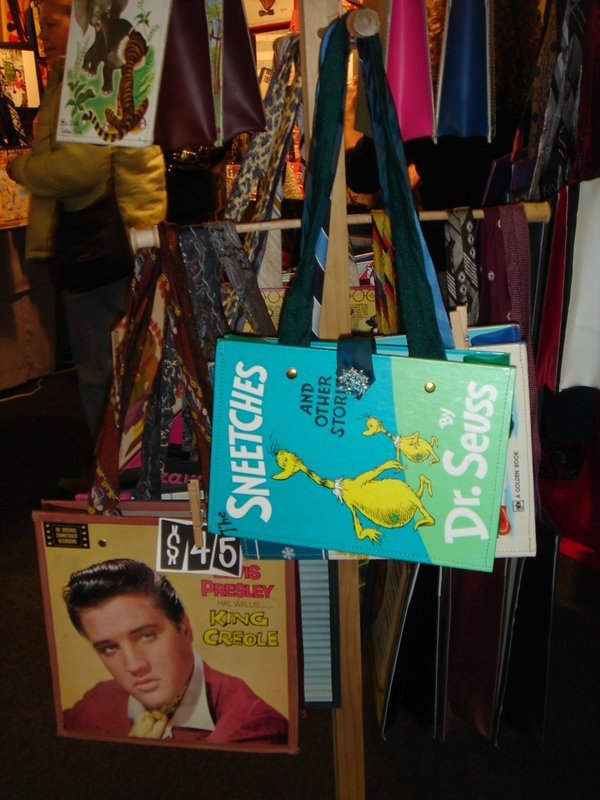 The bags in this photo are made from book and album covers. The handles used to be men’s ties. Every Wednesday the Santa Fe New Mexican newspaper chooses a reader submitted photograph to publish in its travel section. On pure whim, I submitted a photograph from my recent family trip to Croatia. Much to my surprise, my photo was chosen for publication. If you didn’t catch Wednesday’s edition, here is the photo that was chosen. 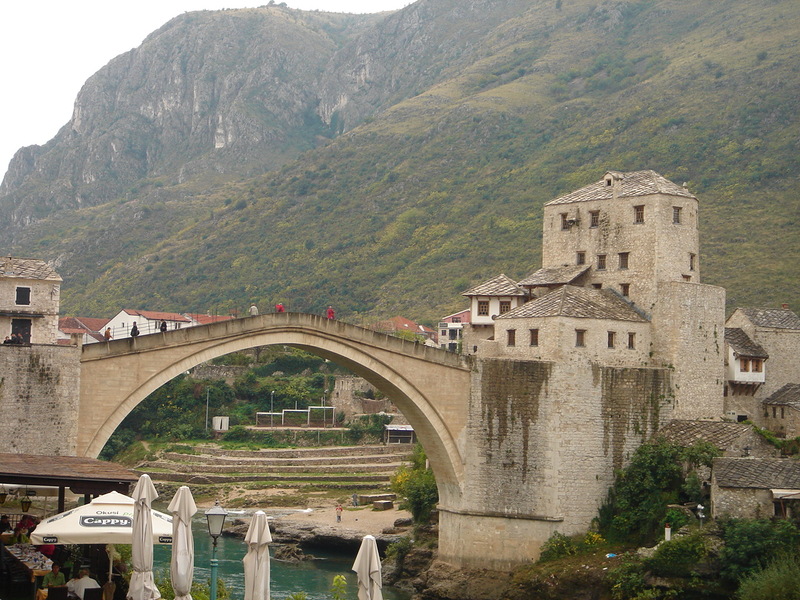 This bridge in Mostar, Bosnia-Herzegovina has a storied history only a few decades longer than La Fonda. Commissioned in 1558 and one of a kind in the region, its stone arch design was considered state of the art technology at the time. Read more about the ‘Sloping Bridge’ here. “Appetite” for a Good Read? It is odd to read a book about the very business you run. But Stephen Fried wrote Appetite for America – How Visionary Businessman Fred Harvey Built a Railroad Hospitality Empire That Civilized the Wild West. I spent time with the charming Stephen Fried in Santa Fe a year or so ago before this book was published and then again recently when he came to La Fonda for a lecture and book-signing. I recently had a chance to finish it and what a page-turner it was. Fried draws on the Harvey history but puts it in the context of events. It is an excellent overview of American history of that era (late 1800s through the mid 1900s) with an intriguing focus on branding and marketing, which Fred Harvey practiced before the concepts were even conceived. While reading, I highlighted several statements Harvey made. 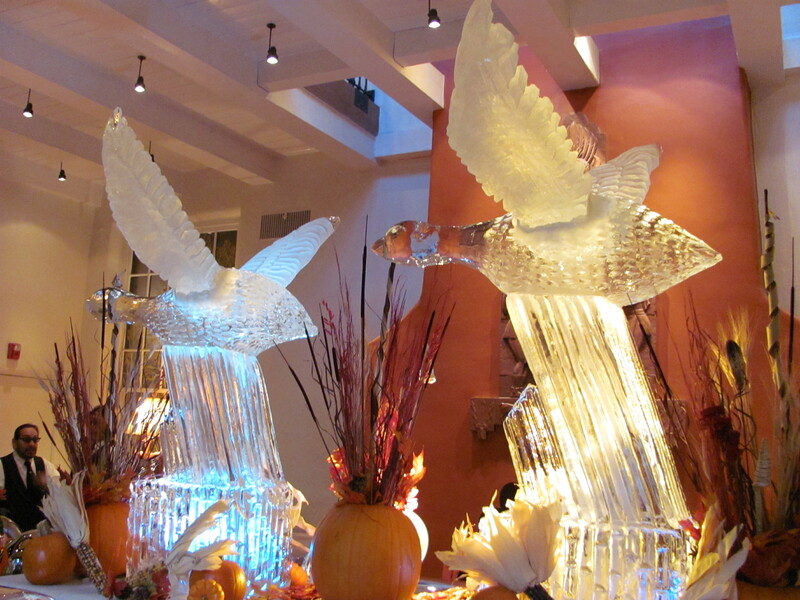 Over a century old, they still apply today in terms of providing top-notch service in the hospitality industry. I share a few of the Harvey gems with our senior staff at our weekly meetings. Have a sincere interest in people. Like all your daily contacts with guests. Radiate cheer and make guest feel at ease and at home. Remember “Travel follows good food routes”. Be human and be yourself. Courtesy and a smile pay dividends. Real service is without discrimination. Tact is an asset and honesty is still a virtue. This book is available for purchase at La Fonda’s gift shop. Call 505-988-1404. I highly recommend it. It is very entertaining and I learned a lot while reading it. One of my husband’s claims to fame is that he actually attended Woodstock. He was practically a baby when he went, but he was there. 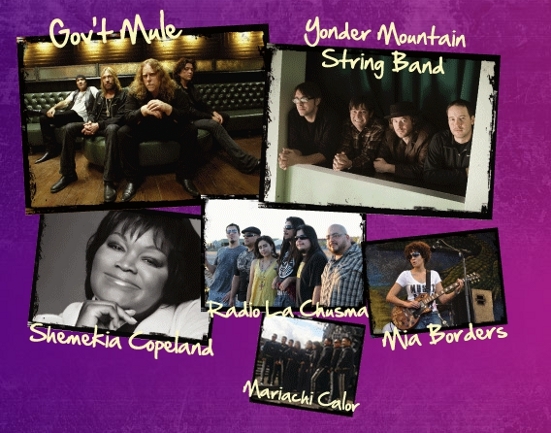 So, when I heard that Taos was hosting its second Annual Mountain Music Festival, I knew we had to go. We headed to Taos on Sunday morning and stopped at Embudo Station for lunch. The food was good – local and mostly organic. 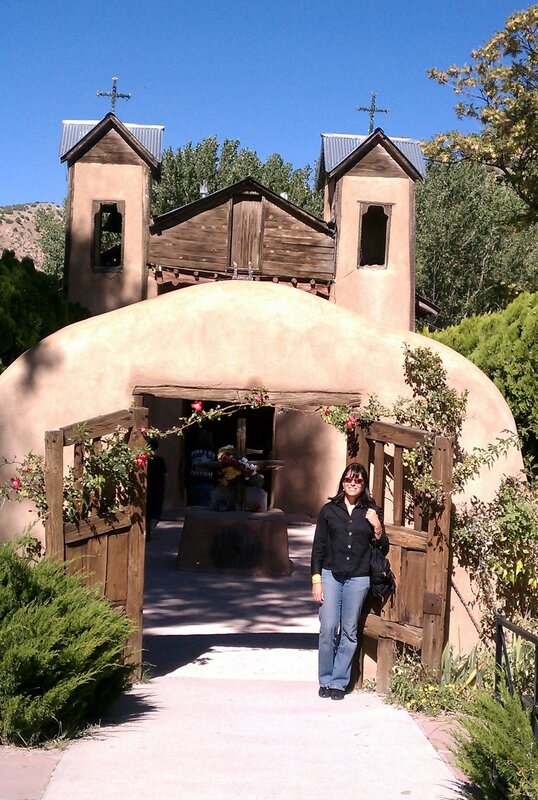 We then headed to Taos and checked into one of our favorite places to stay there, El Monte Sagrado. Our room was in their newest wing which was very pleasant. The décor included pony hair leathers, fringed suede, antler accents and a color palette ranging from rich brown to robin’s egg blue. The effect was pleasant, cool and chic, which we were not expecting – lovely bed and linens to boot. We then headed up the mountain and got situated for the music festival – our “seat” for the performances was a blanket in a field of green grass surrounded by gorgeous mountains. First, we heard Shemeka Copeland belt out the blues, followed by Yonder Mountain String Band, both of whom the crowd adored. Personally, I am not a huge banjo fan unless it is Lyle Lovett’s large band, but they were great. Then the main act took the stage. Government Mule started playing just as the sun was setting and the stars came out. We were treated to some talented rock and roll that went late into the night. Not exactly Woodstock, but there were thousands of music-loving fans who thoroughly enjoyed the day of music in a setting that was hard to beat! We headed back downhill to our digs at El Monte Sagrado, awoke the next day and made our way to Taos Plaza. We lunched at the all new Gorge Bar and Grill in the old Ogilvie’s space. Great new ambiance and the food was delish! If you have not checked out Seconds Eco Store on Bent Street, it is worth stopping in. The cute, energetic proprietor, Sara Basehart, has filled a store full of wonderful items made from recycled products, all of which were great-looking and clever. We then headed back to Santa Fe on the lusciously green, mountainous High Road from Taos, which meanders through Peñasco, Truchas and Chimayo, where we stopped to grab a handful of the miraculous healing dirt. All in all, not a bad 24-hour side trip from Santa Fe! It’s not often that I read a business book that I can’t put down, but Chip Conley’s book, Peak – How Great Companies get their Mojo from Maslow, is one of them. Perhaps it is because, like me, he is a hotelier, and so his examples resonate with me. Perhaps it’s because he references two new friends of mine as an example of connecting customers to a greater cause. Helaine Beckerman, Executive Vice President and General Merchandising Manager for Macy’s in New York City and Santa Fean Willa Shalit, Fairwinds Trading Company’s CEO, partnered to support Rwandan women artisans. I met both these women at Santa Fe’s most recent Indian Market. One more coincidence that might have contributed to my intense interest in this book was a quote on the back cover by another Santa Fe friend, Alan M. Webber, co-founding editor of Fast Company. All these coincidences aside, the book is genuinely a good read for anyone wanting to gain peak performance for their company, while balancing the needs of employees, customers and shareholders. Conley accurately describes his book as being about “the miracle of human potential: employees living up to their full potential in the workplace, customers feeling the potential bliss associated with having their unrecognized needs met and investors feeling fulfilled by seeing the potential of their capital leveraged”. I highly recommend Peak – How Great Companies get their Mojo from Maslow. For the first time ever, the submittals for Indian Market were of such caliber that the judges were not able to choose just one piece as Best of Show. This year we have TWO Best of Show winners. 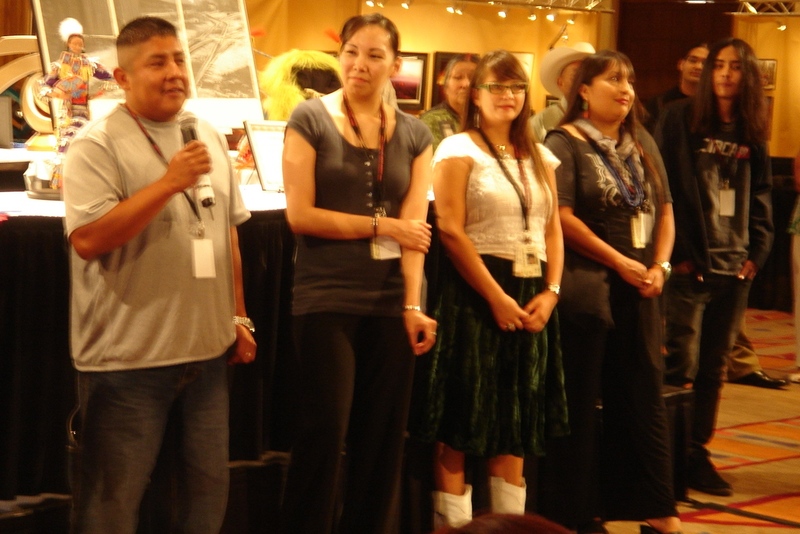 Filmmaker Blackhorse Lowe (Diné) won Best of Show for his film entitled Shimásání, which roughly translated means Runner. It is a wonderful black and white film that was shot on the reservation. 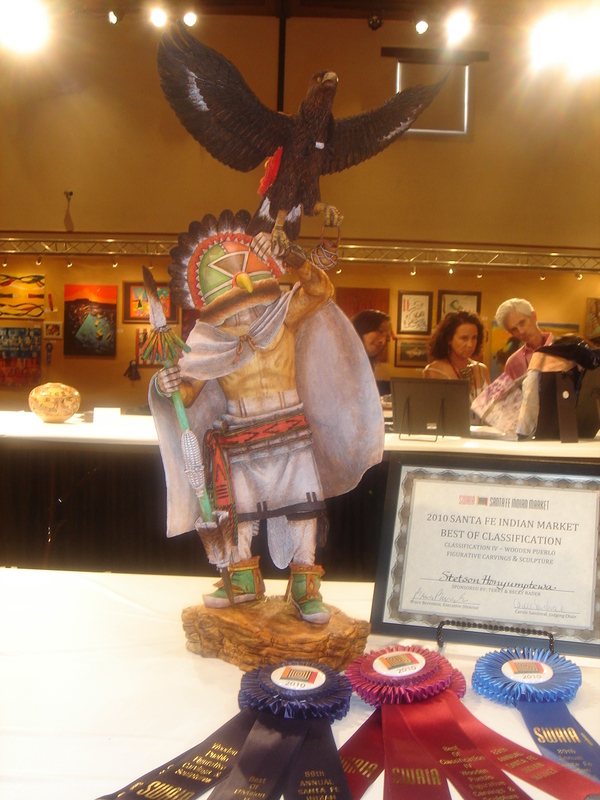 The second ribbon for Best of Show was won by Stetson Honyumptewa (Hopi) for his kachina submitted in the Pueblo Wooden Carvings division. There were several other exciting firsts at this year’s awards. This is the first year to have a film classification at Indian Market and one of the films submitted won Best of Show. 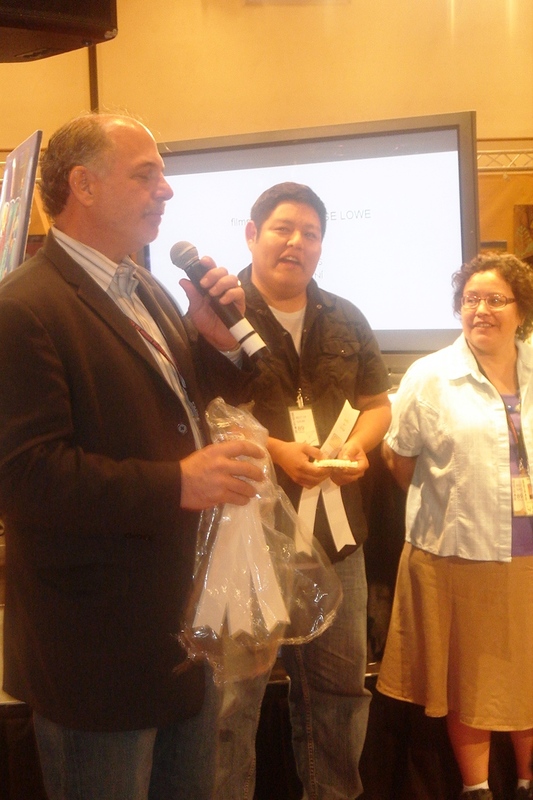 Delores Garza (Haida), a first-year Indian Market participant, won Best of Division in Baskets. In addition, Eve-Lauryn LaFountain (Chipewa) won Best of Division in the Paintings, Drawings, Graphics, Photography division, for a piece of photography. It is the first time that a photograph has won in this division. 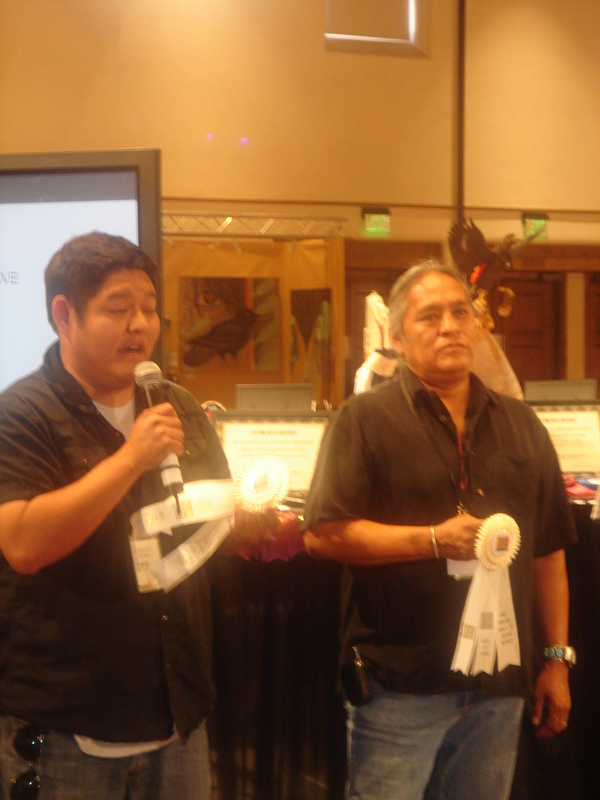 The Best of Show was announced at a luncheon today at the Santa Fe Convention Center honoring all of the division and special category winners. These pieces will be on preview tonight at the Convention Center from 5:30 and 7:30 before they go on sale tomorrow as Indian Market opens. Did you know that La Fonda used to host Indian Market in its entirety? 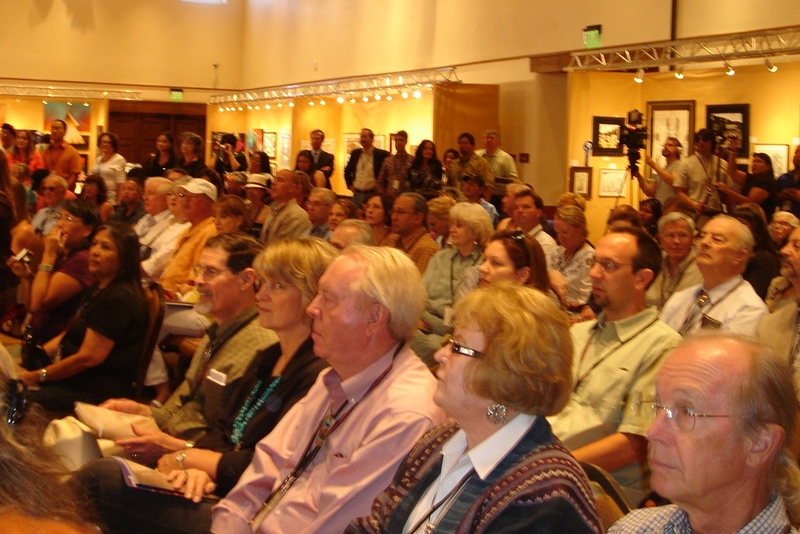 It has grown so large that it now dominates all of downtown Santa Fe and over 1,080 artists are participating in this year’s Market.